I am so excited to be hosting this part of the Great Spring'tacular Link Party Parade! I can't believe the day is finally here....today is my Craft Party! It is an honor to have you join me! I have made so many different crafts over the past few weeks, I had a hard time picking which one I wanted to share with you today. I decided on an Easter wreath I made. 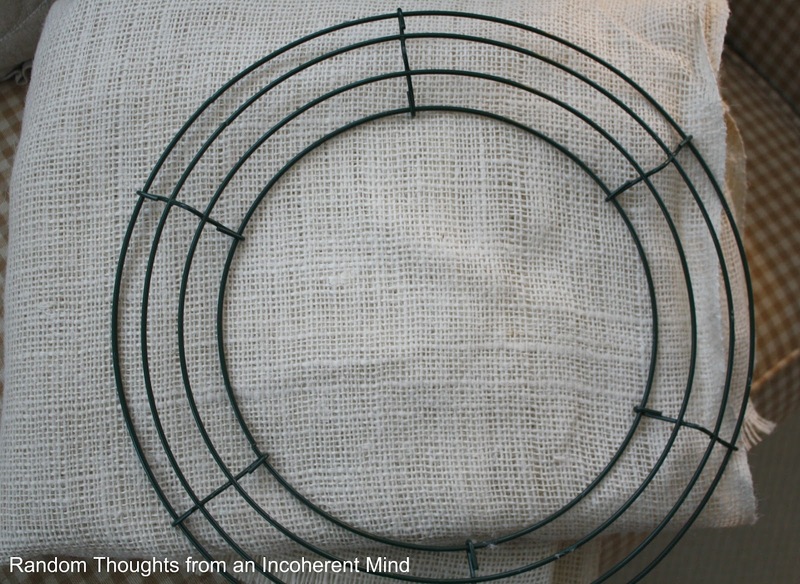 First, I gathered a few supplies...like a wire wreath & burlap. 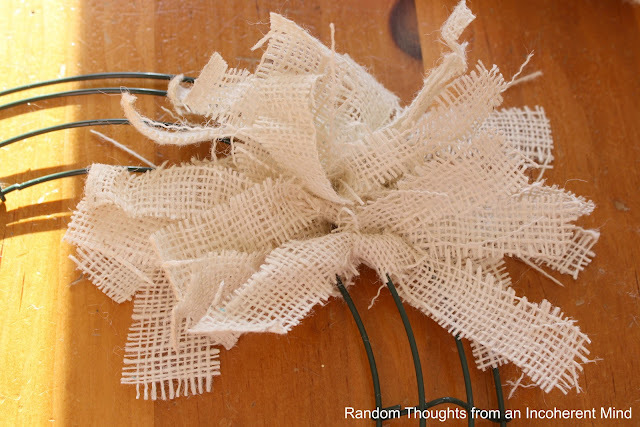 I cut the burlap into strips, about 1 inch by 8 inches long. No, the strips don't need to be perfect. Take each strip and tie them on the wreath form. You want it to look nice & full when it's done, so you can really tie as many strips as you can fit. I would say I used a good yard & half of burlap. I kind of liked the wreath in this plain form, but because this is a Spring/Easter party, adding a little of the season was the way to go. 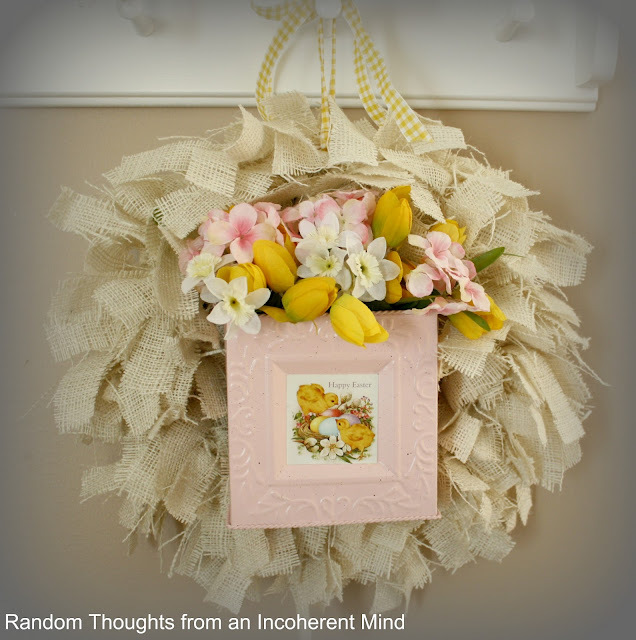 I bought a square pail from Michaels & filled it with some Spring blooms. I then tied the whole thing to the wreath with yellow gingham ribbon. 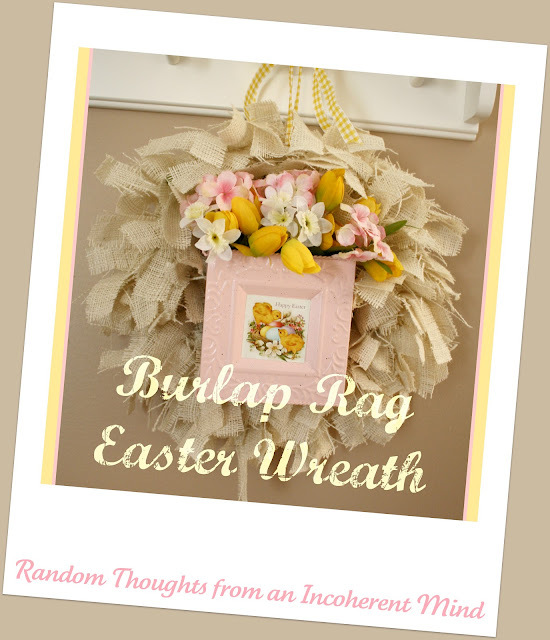 There she is....my Burlap Rag Easter Wreath! Oh yeah, it would be rude of me if I don't warn you. This is a messy project. 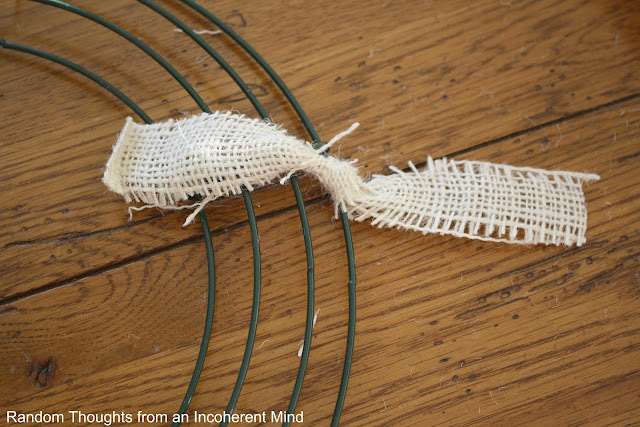 The burlap fibers make quite a mess. Nothing that a vacuum or a good sweeping can't cure, but I thought I should let you know beforehand. Now I am ready to get this party started! ***Please link up your Spring/Easter craft projects. ***Please be sure to add my link to your post so that others can party with us. I so look forward to seeing what you've created and I really appreciate your joining me today for my very first party! I hope I didn't somehow miss the picture option in the linky...let me know if I did this wrong. Thanks for hosting! I'll be back later and visit when there are more links. Have fun! Thanks Gina...Love your wreath and I am so glad you picked that one, it was my fav. Thanks for hosting.Can you add the pictures option? It would be thumbnail...you can go back and change it. Gina, I love it! I want one! It looks great! Your wreath is adorable Gina! Thanks for hosting! Your wreath is so cute!! You can change it out for different seasons.I would love try this!It looks great! I just love your wreath. It looks gorgeous. I will be back to link up. 1. Mouth fell open in big silly smile. 2. Brain said; "LOVE IT". 3. Went to pinterest and double pinned. 4. Then came back to comment. So flipping CUTE. I want it. Most darling wreath I have seen all season. So super-totally-love it. Gina, your wreath is so cute! I love it. You can dress it up for all the holidays, but i really like it all dressed up for Easter. Thanks so much for hosting this linky. I cannot wait to see what everyone else has made! Love your wreath Gina! Thanks for hosting and I'm all linked up. Oh my goodness Gina...I love it. It's soooo cute, and it looks very easy to make. Thanks for the inspiration. I have been working on a project that has been consuming me and a lot of my time... I didn't even realize your Spring'tacular had already started :-( It just snuck up on me. I wanted to participate but didn't plan this out very well. Oh well, at least I can run over and see what others are sharing. Your wreath is gorgeous. The perfect amount of raggedy burlap and lovely flowers. <3! Gina, thank you for hosting! I LOVE you adorable Spring wreath! You did a great job! Thank you for the wonderful tutorial! I have to try this! Hi Gina! Oh, your wreath is adorable! You did a great job and it's all Springy/Eastery! Thanks for hosting your fun party. Hi Gina, love the wreath! 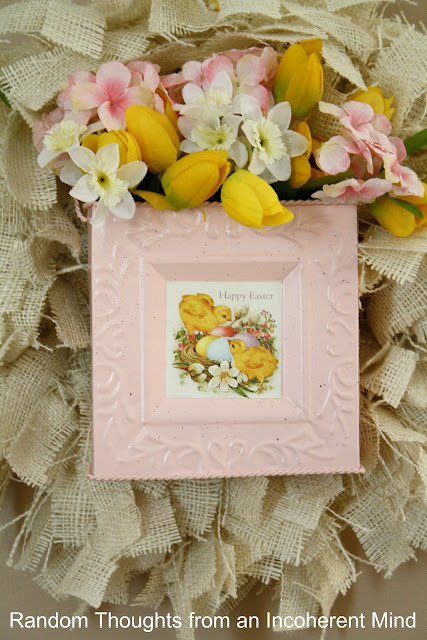 The Easter embellishments are very cute. I know what you mean about messy. I made a garland with burlap tied on jute for my bedroom at Christmas. Burlap was everywhere. Like you said, cleaned up easy. I loved it so much that I have left it draped on my red cabinet. Burlap is so universal don't you agree? Thanks for the fun party. I am now following you. Hey Gina! Your Spring Wreath is awesome! Love Ya! Do you mind if I copy-cat you? Your wreath is fabulous, even if it's a bit messy to make. It's the best I've seen this season, too. Thanks for hosting this party. I can't wait to see everyone else's projects. That is so cute, Gina! I love how fluffy it is, & the little tin container in the center is so adorable. I'm so glad you are keeping this party open for awhile, because I'm still working on my project. So many parties, so little time! I'm new here and looking forward to seeing more of your great ideas!! Thanks for the fun party!!! Gina, do you have blisters from tying on burlap? It is so cute! I added my garden bench. Thank you for hosting! Love the burlap wreath and thanks for sharing with that great tutorial! I guess I better get on the burlap bandwagon soon! Thanks too for hosting the Craft Party! That's so cute that it would be worth the mess. I haven't done a single spring craft or thing around this joint. I need to get crackin'. Gina,your wreath is lovely, I'm going to copy it if you don't mind. Hi Gina! Thank you for letting me know about the linky thumbnail issue. I did just link up again. I love your wreath!!! it is so SPRINGY! I haven't seen anything like it before and I love that. Gina, your wreath is beautiful! How pretty and original! I don't have any spring crafts to share, but I sure will visit all the entries and enjoy all the beautiful projects! visiting from Ricki Jill's place and just wanted to say how fabulous your Spring wreath looks. The tutorial couldn't have been easier to follow and I think I'll be able to create one myself. Hi Gina ... Thanks for hosting this fun party. Happy to be able to contribute. Love your burlap wreath. I appreciate your comment on my concrete bird. Hope you will visit my blog more often. What a fabulous wreath - love the frame in the center! I linked up my Peep Wreath - thanks for the party! Thank you for hosting, I have linked up and now following you, would love for you visit and follow too. Oh, boy I'm going to get some really great ideas here. Thanks. I love your beautiful burlap wreath! Gina this is so cute! I love this wreath. I didn't get a craft done but I'm going to visit all that linked up and get some great ideas! Love the burlap wreath and thanks for sharing!! Thanks so much for you help,and Thanks so much for hosting your sweet Party. Oh my goodness! Your wreath is just so adorable and springy! I love it! Thank you for hosting the party Gina, a little late but I'm glad to be here! Hi Gina! Phewww, home from work and I jumped right on here to see eveyones craty projects! I so love your burlap wreath, just checked to see if I have enough left from making the burlap bulliten board, don't so next time I'm at Hobby Lobby I'm buying alot more! Congrats on a great linky party! I'm all linked up now. I had to wait for today's post to come out first. Thanks for hosting! I would love to have you link this project to my linky party - Time Travel Thursday. Click the button in my sidebar to go straight to the party. 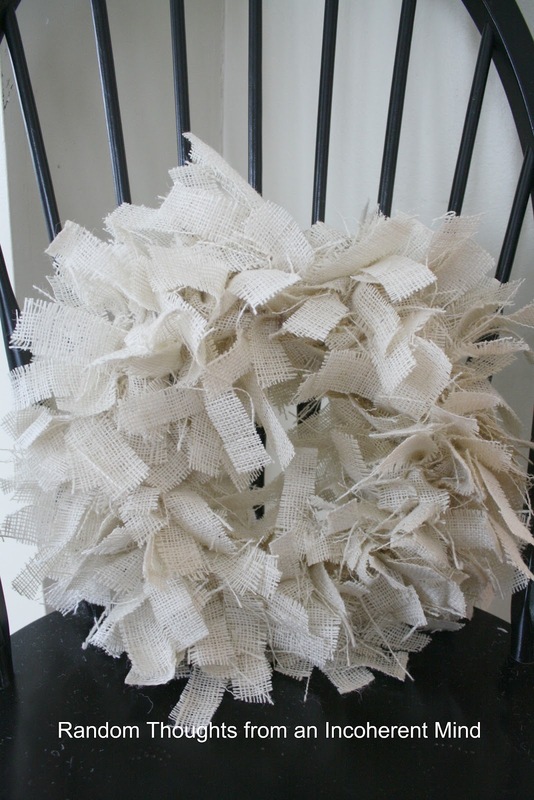 Love your burlap wreath-wanted you to know I featured you on my blog today!! Hi Gina, love your wreath. I REALLY wanted to link up but I seem to be in slow motion lately and didn't finish my project...bummer! Cute, cute idea! Looks so "springy" and we all like that. I'm so glad you decided to link your sweet spring wreath to the party, Gina! Thanks for joining Time Travel Thursday this week. Hope to see you every week. Wow, this is unbelievably gorgeous! !